Imagine what it would be like to capture your hike across the Grand Canyon or your children's soccer game in 3D and relive each experience in breathtaking detail. 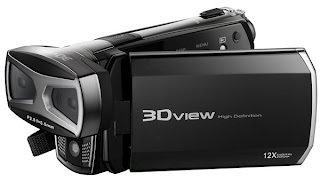 DXG makes your filming dream a reality with the newly released DXG-5F9V high-definition 3D camcorder. The 1080p 3D device is available today at www.dxgusa.com for $299.99, and will be available at additional retailer sites in the coming weeks. Featuring a sleek, compact design and advanced dual-lens technology, the DXG-5F9V records 3D and 2D videos and photos in 1080p HD. No special glasses are required to film or playback your creations. DXG makes 3D technology simple through intuitive menu controls that allow you to easily adjust your shooting preferences between 3D and 2D, or change recording settings to optimize for action shots (720p HD at 60fps mode). "With 3D content quickly becoming mainstream, from movies to games to online networks, it's evident that consumers are drawn towards this exciting video format. Consumers can now easily create their own 3D movies and view their videos glasses-free," said Paul Goldberg, senior vice president of sales and marketing at DXG USA. "Not only is this a great 3D device, it takes incredible 2D video and stills so users can take advantage of both shooting choices whether they have a 3D or HD TV at home." Designed with flexible recording and playback options, the DXG-5F9V allows you to capture hours of 3D video or thousands of 3D photo creations on a 32GB SDHC card (sold separately). Enjoy instant playback gratification directly on the 3.2-inch 3D LCD display or a 3D HDTV, with the camcorder's included HDMI cable and convenient USB and HDMI outputs.